(Cambridge, 2010) xi + 249 pp. Reviewed by Mary Poovey on 2010-10-21. Literary scholars as a professional group undeniably benefited from the Age of High Theory, for as readers tumbled trustingly into textual aporias, and metonymic chains rose to visibility in every kind of writing, members of other disciplines cast envious glances at the methodological self-awareness of the literary bunch and hungrily devoured our theoretical abstractions. During those heady days, some literary theorists even had the temerity to try to make post-structuralism's insights serve a historical agenda, as if conquering the frontier of language were not enough. Even in the surest hands, however, the links forged between High Theory's formalism and historical research were never very strong, and this stepchild of the Theory Age always seemed like a feeble, and not particularly welcome, afterthought. Gradually, as many literary practitioners turned away from Derrida and Lacan, this ambitious goal seems to have lost its appeal, as empirical inquiries into book history and publishing practices, quasi-scientific investigations of the neurophysiology of reading, and low-theoretical topics like genre and mediation have come to dominate scholarly journals. As the bright star of Theory has faded, the discipline of literary study has lost its short-lived ascendancy within the disciplinary constellation, and many of us now not-so-secretly aspire to emulate, if not literally to be, economists, systems analysts, cognitive neuroscientists, or real historians instead of mere readers of literary texts. For a few intrepid souls, however, the goal of soldering High Theory to historical analysis obviously remains alive. If Matthew Rowlinson's new book is a representative sample of this ambition, success remains elusive; and Rowlinson's book--as promising as it is--seems primarily like a throwback, a reminder of what the discipline aspired to be and why it fell from grace. Rowinson's argument takes off from the observation that the monetary system resembles language in deriving its value from an always already deferred ground (like gold or silver). Since this deferral, which is intrinsic to all representative monetary systems, becomes obvious when a country adopts paper money and monetary instruments, Rowlinson focuses on several decades in which Britain was undeniably awash in paper: the "period" between 1816 and 1840. That these decades do not correspond to the literary historical period typically called "Romanticism" or to any other system of periodization used by historians or economists does not trouble Rowlinson, for his real interest is not establishing a period by discriminating between continuity and change but simply identifying a structural theme that recurs in a group of literary texts that interest him. This theme, he argues, "reflects" the structure of money, which, in turn, "projects" that structure onto texts. The structure of money, in this account, is one of internal differentiation, a lack of self-sameness that articulates the failure of the system of money to be systematic or self-contained--that is, to systematically exclude or include certain elements, like foreign currencies or abstract units of account. "Monetary systems in principle cannot be isolated," Rowlinson writes; "they therefore cannot be internally self-consistent or homogeneous" (10). The porous nature of the monetary system, he continues, means that it is always incorporating or disgorging all kinds of elements: "The monetizing of symbolic tokens is a continuous process; there is no money without a residual symbolic element, and no symbol in which the possibility of becoming money is not immanent" (10). The unfixed nature of the monetary system also means that individuals sometimes have trouble figuring out when their obligations have been satisfied, since debt is typically expressed or embodied in a money form (6). Finally, the shape-shifting nature of the monetary system means that "money itself"--and, by an extension that is never fully explained, apart from invocations of "projection," Marx, and the "sublime" (167)--"Capital" always leaves behind an "unaccountable remainder" (85). "Capital's capacity to appropriate the products of human labor is not total: as it absorbs their value, it necessarily leaves behind an unaccountable remainder. This necessity is not the result of a resistance to commodification on the part of the text, or of any other object; rather, it is the projection onto the object of a difference from itself in money, the very medium in which capital identifies the values it incorporates" (85). Rowlinson's abstract account of the monetary form, money, and capitalism is familiar, and the theorists he laboriously works through in the introduction, as well as those he invokes elsewhere in the book, provide a choir of supporting (or authorizing) voices for these assertions. Paradoxically, given the structuralist nature of these claims, the most successful chapter in the book largely subordinates Rowlinson's theoretical account of the structure of money to a historical narrative about bills of exchange, which were introduced into England in the seventeenth century, and the emergence of a national money centered on the pound. In this chapter, he discusses two monetary developments: , national money systems (national currencies, as well as national financial institutions and laws) emerged within the context of the bills that were specifically designed to enable merchants to conduct exchanges across national boundaries; and inland bills of exchange, which circulated throughout England (primarily, but not exclusively, among merchants), interacted with regional paper money, which was issued by local banks and tended not to circulate beyond a fifteen or twenty-mile radius of its point of issue. By the end of the eighteenth century, Rowlinson correctly observes, Britain's monetary system was heterogeneous, if not confusing to its users: it contained legal tender coin, which could circulate across national boundaries but was always subject to clipping or being melted down for export; various kinds of local bank paper; bills of exchange; and Bank of England notes, which enjoyed no particular privilege outside of London. It was the ability of the pound, as a mere unit of account, to assume and refer to these heterogeneous forms that enabled it to anchor a national monetary system--even though any form of currency could "represent that abstraction that was the pound," while always failing to be "the pound in itself" (54). Rowlinson is less successful when he turns to literary texts. The problem with the three central chapters of this book is not that they are uninformative or boring but that the argument of each of them, in its own way, is too convoluted and loaded with the burden of Theory to allow Rowlinson to negotiate the relationship between observed details and Big Claims. Promising lines of argument lose their way. The chapter on Walter Scott's Waverley novels, for example, details with care Scott's relationships to the publishing houses of Constable & Co. and Longmans, as well as to his literary agent, James Ballantyne, and Rowlinson's description of the intricate subterfuges that allowed Scott to borrow against his own work-in-progress is fascinating. Because Rowlinson so carefully interweaves his account of bills of exchange with Scott's literary and financial transactions, I find his central claim convincing: "In the crash of 1826, many of the debts of Constable that Scott was required to pay were ...debts which had originally been due to him in return for novels promised or actually written. To be paid by bill was thus for Scott invariably to sign; and since after Waverley itself, he always had an advance on his share of the profits, Scott wrote his novels to make sure that the bills he had signed were retired. Scott wrote, in short, to withdraw his signature from circulation" (64). When Rowlinson turns to Scott's The Antiquary, however, the argument begins to collapse from a symptomatic combination of interpretive intricacy and conceptual simplicity. Essentially, the problem is that Rowlinson uses a simplistic reflection model to describe the relationship between (his interpretation of) the literary work and those structural features that his theoretical account has identified in the money form, monetary systems, and capitalism. As a result, he has no way to account for the various mediations that separate and connect literary works to social factors and institutions. Rowlinson's interpretive gymnastics are often entertaining, but the only thing these textual interpretations "reflect" (a word he uses repeatedly) are his own interpretations of the money form. To claim that these interpretations provide evidence for a historical argument or that they bear some relationship to historical events is simply to sidestep the investigations of causation, contingency, and relationship that historians typically undertake. In addition to this metaphor of reflection--he claims that (his interpretation of) Scott's novel is "a reflection of the money form" (62) and that the "disguised identities of certain characters in Scott's fiction, and that of the author himself, reflect the disguised identity of the money form" (65), for example--Rowlinson also deploys other metaphors that allude to, but do not analyze, the relationship between a particular literary text and what he has identified as the structure of the money form. "Organize" (65), "symbolically link[...] to" (68), "figure[s]" (69), and is "an extension of" (97) all stand in for what could be an argument about mediation, as does allegory, which he occasionally invokes (72, 95). In his treatments of Keats's "The Fall of Hyperion," Rowlinson gives even less attention to the status of his textual interpretation in the context of his historical claims about the money form and simply relies upon various assertions, which his interpretations are supposed to substantiate: "in his late work, poetry is characteristically posited as the remainder of a process of blockage or unwriting" (133); "Keats' Hyperion poems represent the mythic origin of labor and ...in The Fall of Hyperion' he allegorizes the embodiment of his own writing" (149). His argument about Dickens's Old Curiosity Shop displays some of the virtues of the discussion of Scott, for at least initially, Rowlinson aims to show how Dickens's negotiations with publishers rendered this work an abstraction ("capital") even as he wrote it. Once he begins to bolster his assertions with invocations of Marx and Zizek and Alfred Sohn-Rethel and Lacan, however, Rowlinson abandons any attempt to relate his historical discussion of Dickens's decisions about publication to a form of Theory Speak that ends up exactly where anyone who has read these theorists could predict: "In considering Little Nell's death, we rapidly reach one of the limit-points of formalist criticism, at which the lack of any trace of design may demonstrate a lack of design, or be itself the trace of a design to conceal design. This undecidability is inherent, not merely to narrative, but to all discourse, and indeed to symbolic exchange in general" (172). If the undecidability Rowlinson has just revealed in Little Nell's death is inherent in "symbolic exchange in general"--which, presumably, includes the use of money--then is there anything specifically "Romantic" (or characteristic of any historical period at all) about the assertions Rowlinson is making? In what sense do Rowlinson's textual interpretations constitute new knowledge--if not about the decades from which he takes his texts, then about anything other than the theories from which he takes his assumptions? And why does he think that his interpretations of a tiny number of literary texts can anchor claims as grandiose as the ones he makes here? As I read this book, the interpretations that he presents as evidence for an argument that he claims is historical simply enact the theoretical position with which Rowlinson began. If I am right, this book not only fails to forge a workable union of post-structuralist theory and historical analysis. It also helps explain why the reputation of literary criticism collapsed under the weight of the hubris of High Theory. Mary Poovey is Professor of English and Samuel Rudin University Professor in the Humanities at New York University. Is it necessary to say that this review has very little to do with my book? Mary Poovey is mainly concerned to tell us how far behind she and--in her view--the rest of the profession have left what she calls "High Theory." By her use of initial capitals I presume she intends to signal that critics who use "Theory" are in the grip of a cult or a false religion, a theological view that may explain her idea that Derrida and Lacan are responsible for what she terms literary scholarship's fall from grace. It is tempting to respond to this by borrowing from Shelley--I had rather be damned with Derrida and Lacan than saved with Steven Pinker--but it is surely better just to reject theological allegory altogether as a way of representing the recent history of the humanities. That history is in any case not the subject of my book, which is why it is exasperating to find it coopted for a role in Poovey's story of how we think now. Academic life being what it is, readers may not be surprised to learn that I have recently differed with her about monetary history and its relation to culture in the journal Social History (35. 2 : 15-18). If she still holds the views I criticized there, she doesn't propose them in this review as an alternative to mine, or indeed engage at all with my book's substantive critical and historical arguments. It is difficult therefore to offer her a substantive response. I would like, however, not in a sprit of polemic but as it were in lieu of an actual review, to clear up a misunderstanding and briefly state what Real Money and Romanticism sets out to do. The misunderstanding may well be my fault, but in any case, I do not--as Poovey states--take off from the idea that money "resembles" language, nor do I believe that it has any necessary relation to a ground, deferred or otherwise. My interest is in the historically specific ways in which language turns into money, a process that is obscured if the two are assumed a priori to be similar. In the eighteenth century the most important mechanism for the transformation of utterances--promises and orders to pay--into money was the circulation of bills and notes. My central point about such transformations is that they leave remainders; when the debt it represents is paid, a bill or note survives its own circulation as waste or as a curiosity. When the writers whom I treat come in the early nineteenth century to think about the transformation of literary labour into money, this characteristic of paper circulations has a deep effect on their conception of literary value and its relation to waste. A crucial--and, yes, theoretical--notion at work in the book's argument is that of reflexive determination. In the form I adopt, the theory comes from Marx, but it is to be found in Aristotle's Politics, where he holds that things produced for money come to resemble it, notably in their limitless and autotelic character. In Marx's writing, the figure of reflection for this kind of determined resemblance is pervasive, and, as Poovey has noticed, I use it throughout my work as well. 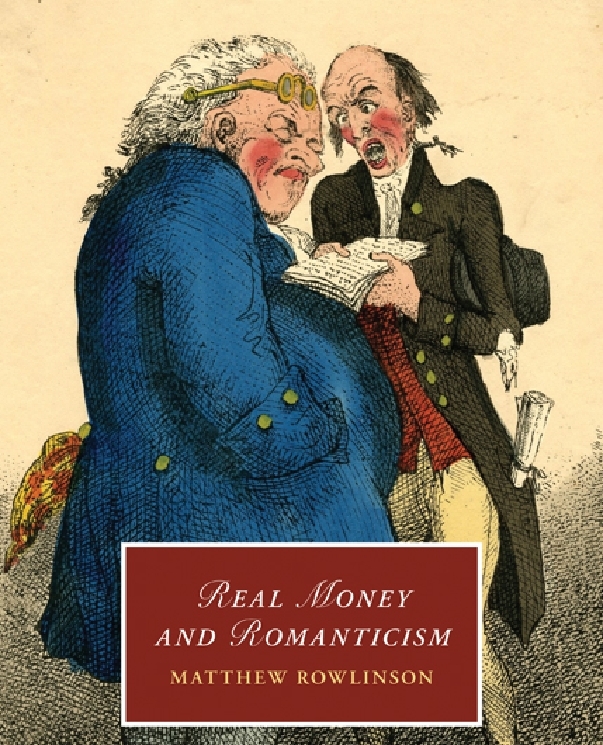 Real Money and Romanticism sets out to show how, once literary labour becomes a commodity, literary form is determined by historically specific forms of money; from the period it covers, an exceptionally tumultuous one in both monetary and literary history, it takes as case histories the work of three writers who had very different relations to their publishers and to the market. The book does indeed, as Poovey avers, aim to solder theory to historical analysis. What literary scholarship doesn't? In lieu of an explanation of why I shouldn't have done this, or how I should have done it differently, she offers only vague terms of opprobrium. The whole review, with its off-kilter irony and weary condescension to "mere readers of literary texts," is intelligible only as an attempt at disciplinary policing with the message: serious people don't do theory any more. I'm evidently not a disinterested party here, but I hope I am not alone in finding this vexatious. Matthew Rowlinson is Associate Professor of English at the University of Western Ontario. Leave a comment on Mary Poovey's review.